DANJUE has a long history and now is a famous brand in China. We are the manufacturer which is specialized in genuine leather products for men and women, including wallets, purses, belts, handbags, clutch bags, briefcase and messenger bags etc. It is one of the leading seller worldwide. DANJUE has committed to serving high grade urban man and woman with items in both causal and business style.The product features superior cowhide material and refined craft. Our professional design team combines exclusive and practical to the products, leading the fashion trend. That's what DANJUE makes the difference! We aim to provide the best quality, the lowest price as well as the highest standard of customer service..
We offer convenient after-sales service. If the item broken, damage or wrong item received, please send us some pictures would be ok, and we will refund or resend in 24 hours. After that, please return it to us. If customer do not like it, we can offer return within 7 days, or give several suggestions we think is better or more convenience. if for other reasons, please feel free to contact us, we will response in one business day and do our best to service you.Thanks for your understanding and waiting time. Leather handbags should always be placed in a cool, dry place. Please clean leather by wiping with special leather detergent instead of water soak cleaning. Avoid chemical pollution which would cause discoloration or stains. Keep all metal accessories away from moisture and cleaning with dry cloth for maintaining appearance. Please allow little color difference due to the monitor and light brightness. Please allow 0.3"-0.9" in size error due to manual measurement. Please allow the smell in course of packing and shipping, but it will be disappeared in a few days air out. [Material /Fabric]: First layer of cowhide leather for the whole bag and micro fiber leather for the flowers (Genuine products. 100% brand new, original and high quality) with polyester lining. [Hardware & Closure & Color] : High quality golden hardware. Zip closure. Black. 1 color for your needs. Use it as casual bag, travel bag, laptop bag or business bag as well. Perfect for everyday use, work or travel. [Structure]: 2 main pockets, perfect for your IPAD, mobile phone, notebook, sunglasses, umbrella, magazine, A4 file, make-up and other daily things. 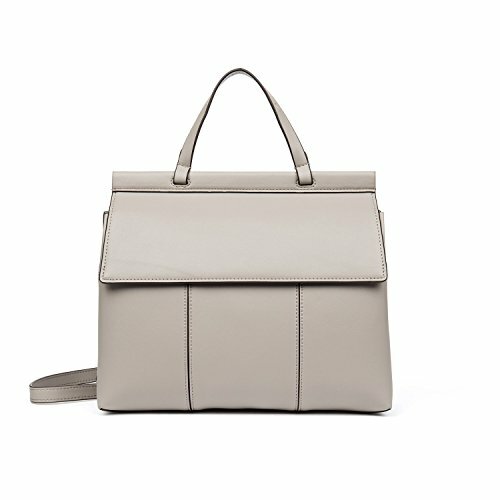 1 inner zipper compartment and 1 adjustable and removable shoulder strap. It is convenient & comfortable to wear in 3 ways, tote, shoulder and cross body. [Dimension]:11.81(L)*3.94(W)*10.24(H)(in). 1 size for your needs. Please allow 0.3"-0.9" in size error due to manual measurement. [Features]: The design is simple and elegant. Ideal for work, business trip, meeting, Party, office job, interviews, wedding or daily use. Carry as a briefcase, handbag, cross body purse, shoulder bag for hands-free. Perfect gift choice. If you have any questions about this product by DANJUE, contact us by completing and submitting the form below. If you are looking for a specif part number, please include it with your message.